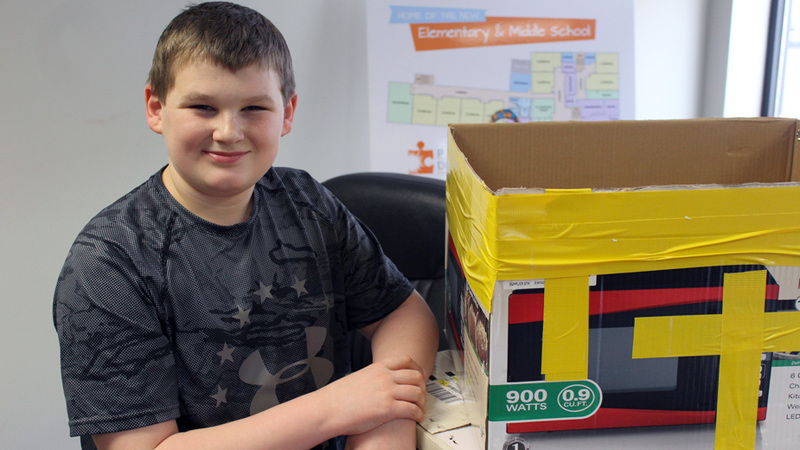 YOUNGSTOWN, Ohio – To someone unfamiliar with the computer game Minecraft, a 14-year-old boy building a yellow Creeper character with cardboard boxes might seem like a simple art project. But to Dylan Oxley, it represents much more. Oxley is a high school freshman at Potential Development, a nonpublic charter school for children with autism. When he has anger issues, he’s excused from class to work on the project, which helps him to calm down. Dylan Oxley is a freshman at Potential Development’s high school. He’s shown with his Minecraft art project. Oxley was diagnosed with level one autism spectrum disorder in February 2016. It’s the least severe level and can lead to behavior issues, including difficulty with social interaction and switching between activities, and problems with organization and planning. In second grade, Oxley was misdiagnosed with attention-deficit/hyperactivity disorder, or ADHD. Oxley’s school had made accommodations and implemented an individualized education program, which is developed for students who need special attention. In 2015, the National Survey of Children’s Health reported that about one in five children earlier diagnosed with autism had been diagnosed with ADHD. On average, those children are diagnosed with autism three years later than a child who has autism with no earlier ADHD diagnosis. When Oxley was diagnosed with autism, Parisi says it didn’t surprise her and she made the switch to enroll her son in Potential Development. At first the switch was a struggle, but Potential Development’s faculty and staff worked with Oxley. 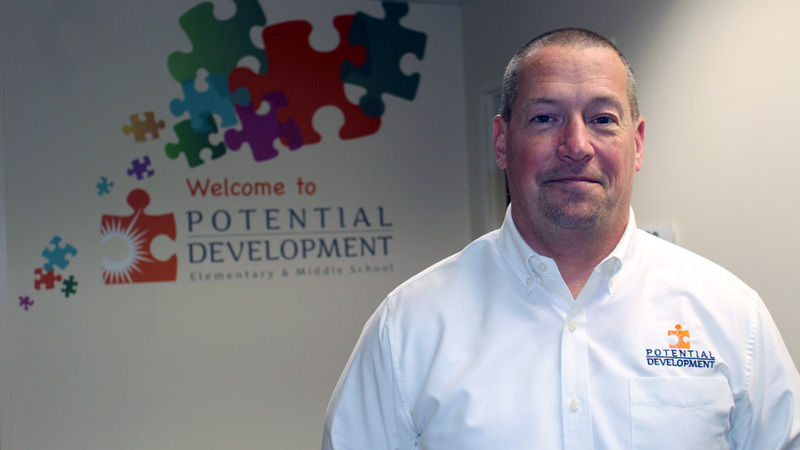 Potential Development differentiates itself from a typical public school by making those special accommodations for students, says its executive director, Paul Garchar Jr.
Paul Garchar Jr., executive director, hopes to expand Potential Development outside the Mahoning Valley. The organization, founded in 1953 as the United Cerebral Palsy Association, changed course in the mid-1970s to address the increase in children with delays in developing their speech and language skills and learning appropriate behavior – children who today would be diagnosed on the autism spectrum. Potential Development received its charter in September 2001 and started enrolling preschool students as young as 2½. School-age programs began in 2008 and the high school opened in 2013, raising total enrollment to a record 165 – a reflection of the increased incidence of autism diagnoses, he says. Potential Development relies on grants from several organizations, including the Youngstown Foundation and its Hine Memorial Fund, and the United Ways of Youngstown and the Mahoning Valley and of Trumbull County. The Ohio Department of Education’s Autism Scholarship Program is another major source of funding. The elementary/middle school building and the high school are on opposite sides of Market Street in Youngstown. The preschool moved into the former elementary/middle school building on East Indianola Avenue. Potential Development also operates PD’s Place Preschool in Warren. Students who graduate from Potential Development, a nonpublic charter school, earn a high school diploma. A special education teacher and at least one aide teach classes of up to seven students and faculty take part in ongoing professional development programs. Lauren Karas, a 2010 Youngstown State University graduate, teaches a classroom of fifth- and sixth-graders and brings six years of experience from teaching in the Boardman and Struthers school districts. She’s halfway through work on her master’s degree in counseling at Westminster College. Curriculum “really focuses on their individual needs,” Karas says, because it sets academic goals in math, reading, science and social studies. Students work independently in their personal, assigned areas and receive guidance when needed. Sensory breaks are “a great opportunity for them to get up and get moving,” she says. Interactive music and dance videos integrate movement and mindfulness, while sensory rooms can help students to either relax or energize. Workspaces are individualized to each student and a table in the center of the classroom allows for group activities. 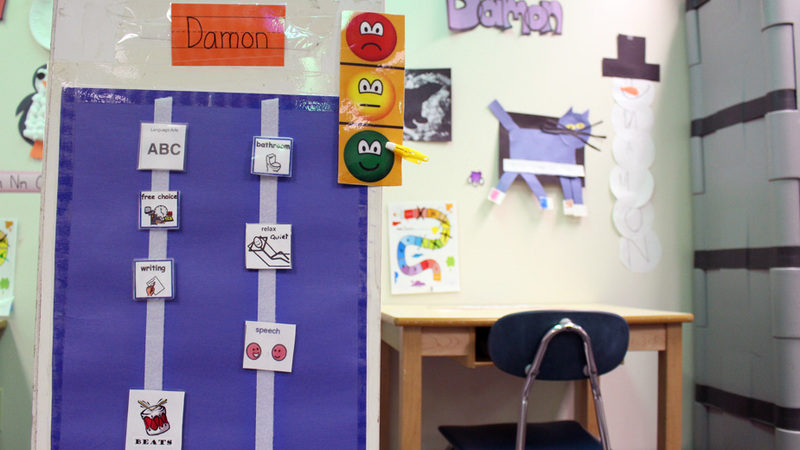 Some classrooms are organized specifically for nonverbal students. For these students, teachers use special boards with pictures and icons to help them plan their day. Teachers use picture symbols to help students plan their day. The picture symbols represent core vocabulary words, such as “I” and “like,” and are universal throughout the United States, says Denise Firestone, Potential Development’s speech and language pathologist. Teachers work with students to arrange the symbols to form sentences that indicate if the child is hungry or needs to use the restroom. “They help children when they’re first learning augmentative communication or if they’re nonverbal and starting to learn to become verbal,” Firestone says. Many of the students at Potential Development have difficulty grasping and using augmentative communication despite the efforts of faculty and staff. However, they do communicate their wants and needs in a variety of ways. Speech pathologist Denise Firestone is responsible for identifying those individual communication modalities with each student. Modalities can be anything from a student who waves to another adult or a peer, or makes fleeting eye contact when he lacked the skill weeks before. Firestone, a graduate of Ohio University with a master’s in speech and language pathology, understands how communication is a vital part of a person’s being. 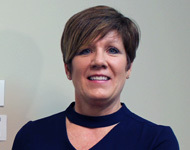 While she started her career working with patients who suffered a head injury or a stroke, she decided to work with children with autism, both verbal and nonverbal, because they need a viable outlet for social and educational communication, she says. Working at Potential Development enables Firestone to spend extra time every day interacting and communicating on all levels with students. 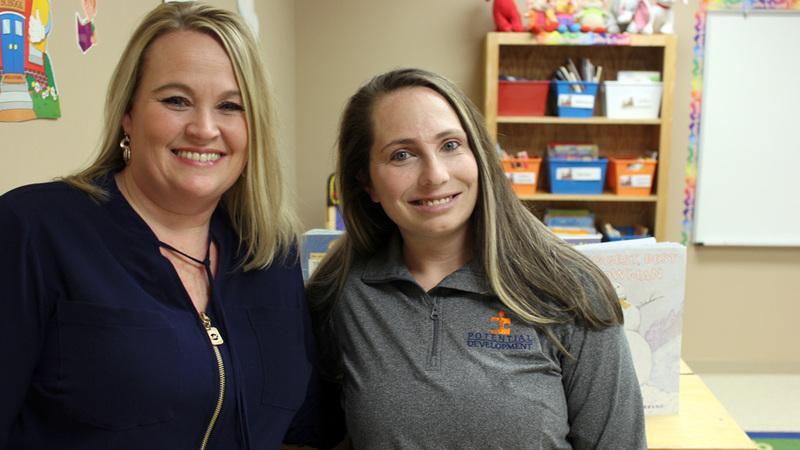 Watching the students grow and begin to have meaningful communication with their loved ones, peers and other adults “makes me feel like we’re making a difference for them in their life and the quality of their life,” she says. The school also employs augmentative devices such as iPads and GoTalk, the latter a programmable communication device that uses picture sheets that represent items or phrases such as “Hello, it’s nice to see you,” “I need help,” or “I need to use the bathroom.” Students communicate by pressing the icons. Speech and occupational therapies are conducted in the classroom or in therapy rooms. Occupational therapy focuses on motor skills, such as using a pencil, while speech therapy is important for communication and verbalization. Communication was a big issue for the children of Elyssa and Chris Thomas when they were diagnosed. Twins Colton “Colt” and Hunter, 5, are on the more severe end of the spectrum while their sister, Zoe, 4, is moderate. 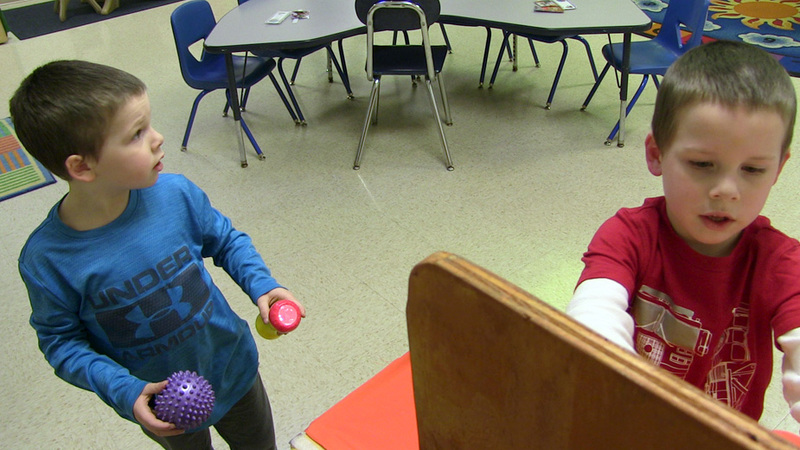 Twins Hunter and Colton Thomas, 5, enjoy some time in the elementary/middle school’s occupational therapy room. Before the diagnoses, the twins weren’t meeting the mobility and communication milestones reached by Elyssa Thomas’ first son who isn’t autistic. After the diagnosis, the Thomases didn’t know where to get the help they needed. That was the most difficult part, Thomas says, because they had just moved back to Youngstown from Charlottesville, Va.
Thomas heard about Potential Development from her husband’s co-worker, but was apprehensive about moving the twins from their public preschool. A big change can be difficult for children with autism, she says, but she was intrigued. All three enrolled in the preschool program for the 2017 school year and already Thomas is seeing improvements. Potential Development works with other organizations to provide its students with physical activities. Gymsters holds gym class at the preschool once a week in the building’s group activity room. Smarts – Students Motivated by the Arts – organizes drum circles at the elementary/middle school to encourage and engage the students’ communication and motor skills. A renovation planned for the second floor of the elementary/middle school building will allow Potential Development to offer more programs and expand its reach, Garchar says. The school works with 32 school districts in Mahoning and Trumbull counties and is looking to expand outside the Mahoning Valley. The renovation would add eight more classrooms and an elevator, which could translate into another 50 to 60 students, he says. The timeline depends on funding. The school has introduced extracurricular activities, including swimming lessons, basketball, bowling and springtime track. 2017 was the first year the school participated in the YSU English Festival. Potential Development is developing relationships with community colleges and other institutions for vocational support after students finish their senior year of high school. That’s something parents such as Elyssa Thomas are very happy to hear. Jackie Parisi and Elyssa Thomas say their children and making great progress. Potential Development welcomes monetary donations from individuals and groups, as well as volunteers for its various school committees and special events. Click here for information on how you can support Potential Development.